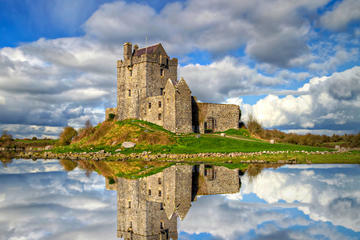 On Ireland's western shores, along the banks of the River Corrib, lies the medieval city of Galway (Gaillimh). Small and intimate, this metropolis gives tourists a taste of all the delights for which Ireland is well known. The arts and music scene is second to none in the country. Festivals take place throughout the year and contribute to the bohemian vibe of the area. Nicknamed the City of Tribes, 14 aristocratic merchant families controlled the area beginning in the 12th century. As a trading port for much of Ireland, Galway's Spanish influence is clear to this day and remains a part of the culture. Architectural fragments of a long and storied history are parsed throughout, including the medieval wall once surrounding Galway City. Of late, the country has been having a bit of a culinary renaissance, and foodies are delighted. Much of the buzz has been coming from the local chefs of Galway, who are taking advantage of the delicious natural resources this fertile island and surrounding waters offer. Find out more about this lively city with our list of the top attractions in Galway. Beginning a tour of Galway at the historic Eyre Square makes perfect sense as it represents one of the most important gathering spots since medieval times. Also known as John F. Kennedy Memorial Park, after the US President of Irish descent, the square links the center of the city with a popular shopping area. This former home to food markets is a favorite of pedestrians. The public artwork takes tourists through several important eras of Irish history. A dramatic rust-colored fountain sculpture represents Galway Hookers, traditional sailing vessels of the area. Visitors can almost feel the wind whipping at their sails. In addition, Brown's Gateway is built into a structure on the Northwest side. As the doorway to an old patrician mansion, it stands as a memorial to one of the original Tribes of Galway. There's a striking monument to the Irish language poet Pádraic O'Conaire (1882-1923), who is represented sitting on a rock. West of Eyre Square there's a modern shopping center of the same name, which has become a popular place to stroll and soak up Irish culture. Be sure to make your way to the atmospheric Shop Street (continues on from Williamsgate Street just off Eyre Square), which, weather permitting, is generally brimming with buskers, also known as avant-garde street performers. For some local flavor and a bit of a bohemian vibe, head to Galway Market, a favorite of both tourists and residents for produce, food, and crafts. Situated on Church Lane by St. Nicholas Church, this centuries-old, bustling venue has hundreds of stalls. Often you can get the chance to taste some of the delicious Galway seafood. Food vendors offer an assortment of flavors, and of course there are sweets for all. Hours vary according to season; make sure to check their website before heading out. During the Christmas season, it is especially festive. Adjacent to the Galway Market, you'll find the Anglican/Episcopal St. Nicholas' Church. It was built in the 14th century and, although much altered in later centuries, has preserved the aspect of a medieval parish church. Where else can you find a church dedicated to St. Nicholas of Myra (Santa Claus), patron saint of children and mariners? Attending a service will transport you to the spirit of yesteryear. Exterior highlights are the gargoyles, which are rarely seen in Ireland, and the triple gables of the west front. Inside are tombs and memorials to many names you might recognize. Throughout the centuries, famous people are said to have visited St. Nicholas, including Christopher Columbus who perhaps worshipped here during a visit to Galway in 1477. A short eight-minute walk from St. Nicholas' Church takes visitors to Galway Cathedral overlooking the River Corrib. This is a beautiful site at night. Along the way, literature buffs may wish to make a stop at the smallest museum in Ireland, Nora Barnacle's House (Nora was James Joyce's wife). Built in the late 1950s, the cathedral was and is the youngest of Europe's grand stone cathedrals. It was designed by J.J. Robinson in a blend of styles; Renaissance details mix with Romanesque and Gothic features. The cathedral also displays a superb collection of art, including a large Crucifixion mosaic by Patrick Pollen, beautiful rose windows, and a statue of the Virgin by Imogen Stuart. One of Galway's top activities for tourists is a soothing cruise along the River Corrib and lake aboard the Corrib Princess. The 90-minute ride gives a scenic overview of the area and panoramic large windows for all to enjoy the sites. Three bridges span the river. The farthest upstream, built in 1818, is the Salmon Weir Bridge, where in spring, hundreds of salmon can be seen making their way up river to the huge expanse of Lough Corrib. O'Brien's Bridge in the middle is the oldest and dates from 1342. The Claddagh Bridge (a swing bridge), at the south end of the town, takes its name from an old fisherman's quarters and guild on the right bank, an area that's now given way to modern buildings. Claddagh, just outside Galway, is known as the oldest fishing village in Ireland. The famous ring, symbolized by two hands clasping a heart, is said to have originated here and was traditionally handed down from mother to daughter. Working your way back along the riverside from Woodquay, you'll come upon the famous Spanish Arch after approximately 10 minutes. It's an iconic spot to rendezvous with friends and is one of two remaining arches from the original front wall. This in turn leads to Spanish Parade, once the favorite promenade of Spanish merchants. After a photo op along the gate, a few minutes more, and visitors will arrive at the Galway City Museum, a modern glass structure built to reflect the surrounding city walls. The museum displays both permanent and touring exhibitions covering Galway's heritage, history, and archaeological treasures. Residents of the area have donated many personal items to the collection of more than 1,000 pieces and are proud of the historical importance it represents. If time permits, these islands should be far up on the sightseeing agenda. Located just off the coast of Galway, the islands boast several worthwhile tourist attractions, including an outdoor museum scattered with Celtic churches of significant historical importance, the spectacular Dun Aonghasa and Cliffs of Aran (venue for an annual cliff diving contest), and the setting of the film Man of Aran. Naturally enough, this is also home of the world-famous Aran sweater. In addition to these attractions, the islands offer a peaceful escape from the hustle and bustle of the mainland. Regular ferries connect the islands to the mainland, and there's a plane service from Galway airport. Consistently voted one of the prettiest villages in Ireland, the picturesque village of Clarinbridge lies just over 17 kilometers south of Galway city. Located on the mouth of the Clarin River at the end of Dunbulcaun Bay, this destination represents the easternmost part of Galway Bay. The area's famous Oyster Festival includes live music, dancing, and a gala ball. Make plans to visit the festival, taking place annually since 1954, during September. A farther 40-minute drive from Clarinbridge, through unique scenery and appearing otherworldly, brings visitors to the heart of The Burren in County Clare, a barren yet serene and magical place. The Burren is famous for its beautiful rock formations, impressive diversity of plants and animals, and important archaeological sites such as the Celtic high cross in Kilfenora. The beautifully-preserved Corcomroe Abbey is one of the most popular attractions in the area. Hiking, fishing, photography, and caving are other top things to do in the area. Fans of local products will be well advised to visit the Burren Perfumery. Taking their inspiration from the surrounding landscapes, the company's organic cosmetics and fragrances have a cult following and are shipped worldwide. The small café makes for a nice rest stop and is covered with scented roses in season. No matter how many times you've seen photos of the Cliffs of Moher, this is a destination that delivers all you were hoping for and more. The breathtaking destination stretches for eight kilometers along the coast and embodies all the characteristics that have made the Wild Atlantic Way famous. Crashing, crystal blue waves roll in and out of the majestic cliffs, often producing a mesmerizing trance. On a clear day, Galway Bay and the Aran Islands can be seen off in the distance. Make sure not to miss the incredible views of this spectacular landscape from O'Brien's Tower, a short climb worth every step. 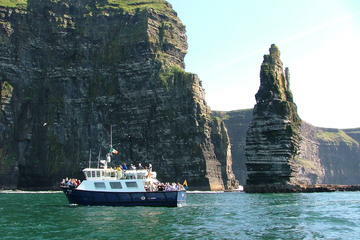 A convenient way to visit the site is on the full-day Cliffs of Moher Day Trip from Galway, which takes visitors through charming fishing villages on their way to this UNESCO-listed site. Luxury Hotels: Travelers wanting to stay in a room with a view and a short five-minute drive from the center of town would like the Galway Bay Hotel. Situated with excellent water views, the hotel has a gym, pool, steam room, and sauna. The on-site restaurant is known for the excellent seafood on its menu. For a five-star luxury stay complete with spa, visit the g Hotel and Spa Galway. The influence of milliner Philip Treacy can be seen in the elegant décor. Colors associated with royal families dot the luxurious accents and rich velvets in this 100-room property. Traditional afternoon tea is served, and guests will appreciate the free Wi-Fi and parking. Visitors looking for an estate stay should book the Glenlo Abbey Hotel. Sited on a picture perfect 138 acres along the Lough Corrib, this property will take visitors back to another era. While it might be hard to leave, Galway City is only a five-mile drive away. The award-winning Pullman restaurant is housed in two original Orient Express train cars for a unique dining experience to cap off your stay. Mid-Range Hotels: Just a short walk from the action of Eyre Square, tourists will find good value at the Park House Hotel. This four-star historic hotel has a quaint boutique feel, and offers a full Irish breakfast. On-site secure parking is also available. Jurys inn Galway has affordable rates and a lovely view of Galway Bay. Located just steps from the Spanish Arch and contemporary in feel, this hotel is within walking distance to most sites and offers parking, an attractive amenity in what can be a congested area. Budget Hotels: Galway has more than its share of budget hostels, some of which are hotel style, with private rooms and bathrooms. Barnacles Hostel Galway is one such spot located in the heart of the Latin Quarter. Free Wi-Fi and breakfast add to the appeal, as do the comfortable common areas complete with computers, games, and a full kitchen. Hotels in this range include the Travelodge Galway, a great-value budget hotel featuring comfortable beds, free parking, and Wi-Fi. The location is about a mile from the city center. Ireland's Charming Capital of Dublin: Most visitors to Ireland will want to explore the highlights of Dublin at some part of their trip. The good news is that unlike the twisty, narrow roads covering most of the country, tourists can drive or catch the train from Galway to Dublin in just over two hours. A wide selection of hotels await their stay. Once tourists have explored the charming capital, they'll find the city is a great base for some day trips from Dublin to other parts of the Emerald Isle. Southern Castles, Museums, and More: Continuing south from Dublin will bring tourists to the city often called the second capital of Ireland. Located on the banks of the River Nore, Kilkenny offers many architectural gems and things to do. No trip to Ireland can be considered complete without a drive around the dramatic and iconic Ring of Kerry and all the magic it has in store for those who visit.